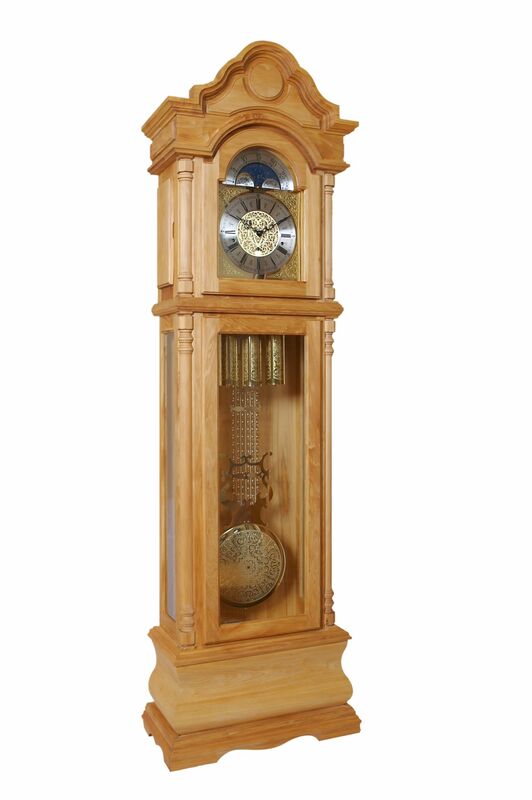 This clock is pictured in Podocarpus Latifolius, or Cape Yellowwood, a rare hardwood grown in the Tsitsikamma Forests The clock features a deeply curved base with a low door that creates the impression of a very slow swinging pendulum. The glass panels on the side of the clock allow natural light to play on the embossed accessories. The Luxus dial features the four cornices with raised borders surrounding filigree netting, which is repeated in the center of the dial. The brass aluminium roman numerals are laid onto a brass aluminium dial ring, making for an understated luxurious dial. The Hermle cable movement plays the Westminster, Whittington, and St Michael melodies, and has an automatic night silencer option. Price: ZAR 72 000.00 Incl. VAT, Excl. Delivery.